Çalköy (Zafertepe) (Upper Tembris Valley): in a yard. White marble stele with tenon, broken above. In the upper register, four female figures in relief, each dressed in a chiton with a loose himation draped over the left arm. Each figure holds an object in both left and right hand: the second figure from the left appears to be carrying a loaf of bread in her right hand and a bird in the left hand; the figures at far left and far right each carry a drooping object, perhaps a bunch of grapes, in their left hand. In the lower register, a mounted male figure in relief, dressed in trousers, tunic, belt, flowing cape and Phrygian cap, holding palm-leaf in his right hand. Ht. 0.68+; W. 0.35 (shaft), 0.39 (base); Th. 0.07 (shaft), 0.10 (base); letters 0.016-0.022. MB notebook copy; photograph (1956/22). Line 1: upsilon omitted by the mason. Line 3: alpha and sigma om. mason. I, Trophimos son of Euphemos, set this up for Tetraprosopos, just as she ordered. The ‘four-faced’ goddess is known from two votive monuments from the region of Dorylaion: see MAMA V 101 (Keskin: Μητρὶ Τ̣[ετρ]α̣προσώπῳ) and SEG 14, 782 (museum at Eskişehir: θεᾷ Τετραπροσώπῳ). A third dedication to the goddess was copied by Anderson at the village of Küçükhasan, in eastern Phrygia (Anderson 1899: 303, no. 237: Μητρὶ Τετραπ[ρο]σώπῳ); on the findspot, see further the commentary to MAMA XI 218 (1954/33). 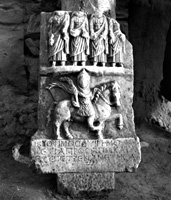 From the upper Tembris valley, a statuette of four women carrying garlands, standing back-to-back around a pillar, from Beşkarış Hüyük, 13km north-east of Çalköy (Zafertepe), was plausibly identified by Cox and Cameron as a representation of Meter Tetraprosopos (MAMA X 53). However, the closest parallel for this monument comes from the village of Hasanköy, on the territory of Akmoneia 30km south-west of Çalköy. MAMA VI 245 is a votive stele to Μητρὶ θεῶν Κασμινῇ, set up by Ammias on behalf of her foster-father Markos. The formula at the end of the inscription (τὴν στήλλην ἀνέθηκα κατὰ ὡς ἐπέταξε, lines 3-8) is almost identical to that of the stele from Çalköy; note in particular the use of κατὰ ὡς for καθώς. Above the inscription, the feet and lower bodies of three female figures are visible; the editors of MAMA VI comment ‘part of three female figures, broken away’ (thus also Lochman 1990: 461, n.30: ‘La partie inférieure de trois corps féminins juxtaposés indique très certainement la Triple Hécate’). However, it is clear from the layout of the relief that there must originally have been four female figures depicted here, as on the stele from Çalköy. It therefore seems extremely likely that the goddess (Μητὴρ) Τετραπρόσωπος of the Çalköy votive stele is identical to the goddess Μητὴρ θεῶν Κασμινή of the Hasanköy inscription. A second votive stele from central Phrygia also carries a dedication to Μητρὶ θεῶν Κασμεινῇ (Naour 1985: 45-6; SEG 35, 1399). 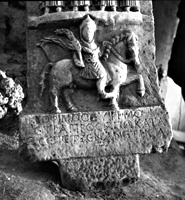 The original location of this stele is unknown; it was copied by Buresch at Uşak in 1895 (Körte 1902: 32, no.57), and is now in the Louvre (Michon 1906a: 184-7, with Pl. III). 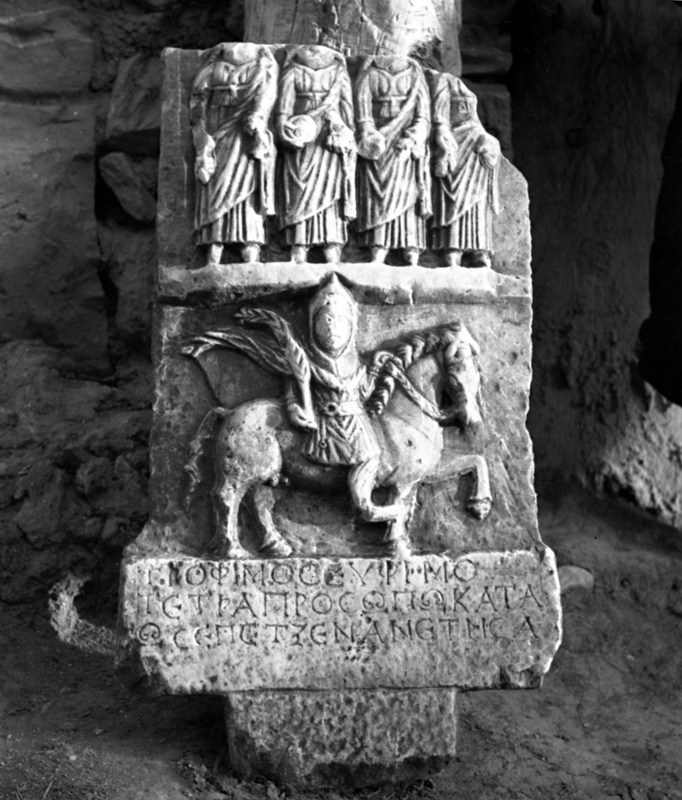 The Μητὴρ θεῶν Κασμινή also appears in a votive stele from the rural sanctuary at Çavdarlı near Afyon (BE 1967, 587: Νίκη Μητρὶ θεῶν Κασμεινῇ εὐχήν; for this sanctuary, see Akok 1965; Robert 1987: 335-40). It is likely enough (as suggested by Brixhe, BE 2000, 597) that the epithet Κασμ(ε)ινή derives from an unattested toponym Κασμ/ος. Κασμος appears as a personal name at Thiounta, north of Hierapolis (Ramsay, Phrygia 143-4, no.31; Zgusta 1964: 686, Nachtrag [‘unklarer Name’]; Robert, OMS VII 563-7), and the female name Κασμεινα is now attested in Phrygia, as the name of a dedicant at the sanctuary of Zeus Alsenos at Kurudere, north of Afyon: see Drew-Bear, Thomas and Yıldızturan 1999: 173, no. 242 (Κασμεινα Δεὶ Ἀλσηνῷ εὐχήν), with p.394. The rider in the lower register is depicted wearing a Phrygian cap and carrying in his right hand a palm branch, resting on his right shoulder. This certainly represents the god Men, who is depicted in exactly this style in four votive reliefs from northern Phrygia, from Nuhören, south of Kütahya, Süpü Ören, south of Eskişehir, Değişören, in the territory of Nakoleia, and an unknown location near Eskişehir (Delemen 1999: 58, nos. 317, 320, 323, 353). Men is also depicted carrying a palm branch alongside Hekate triformis on a funerary stele from the upper Tembris valley (Pfuhl and Möbius 1977-9: II 502-3, no. 2089; Lochman 1990: 457). The village of Çalköy-Zafertepe (TIB Phrygien 218, s.v. Çalköy), south of Appia in the upper Tembris valley, should not be confused with the homonymous village of Çalköy in the Gireğiovası, further to the north; for monuments from the more northerly Çalköy, see MAMA X 276-9. For other monuments from Çalköy-Zafertepe, see MAMA VI 275 and 285 (Waelkens 1986: 119, no. 285); MAMA X 156 (doorstone); MAMA XI 132 (1956/23: statuette of Hekate triformis).